Toronto, ON: Fitzhenry & Whiteside, 2000. Marsha Forchuk Skrypuch has set her latest picture book during one of the darkest periods of Ukrainian history, that of the famine instigated by Stalin in the 1930's. Most Canadians who are not of Ukrainian descent know little about this man-made catastrophe which many historians today regard as a war between the Kremlin and the Ukrainian peasants. In this unequal struggle, villagers were forced to turn over their entire supply of livestock, foodstuffs and seed grain to the Red Army and the Secret Police. The result was a horrific death toll which most authorities place at 5 million or more. 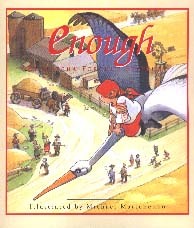 Marusia, the plucky little heroine of Enough, lives with her father on a farm near the village of Zhitya. Most years their farm produces barely enough food for the two of them, but one year the crop is good. Just as Marusia and her father are harvesting the wheat, a soldier arrives to tell them that there is a Dictator now, and that their wheat and farm belong to the People. Marusia, wise beyond her years, realizes that the Dictator's soldiers will soon be back for the whole crop and hides a sackful of grain in her hope chest. Sure enough, her fears are realized when the soldiers return and take all but the hidden grain. Next spring, as the villagers face certain starvation, Marusia gains the help of a giant stork who flies her over the ocean to the Canadian prairies where immigrant farmers generously give her a babushka full of grain to take back to their Ukrainian cousins. Alas, at the next harvest season, the villagers awake to find their fields picked clean. 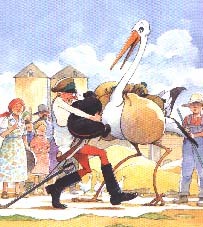 When a greedy officer encounters the magic stork, he shamelessly asks for help. pretending that his soldiers have nothing to eat. The stork offers his back, and they fly across the officer's once beautiful homeland, now covered with empty fields and full graveyards. On the Canadian prairie, the officer takes advantage of the farmers' generosity, loading the stork with far more than "enough." Although soldier and sacks fall into the ocean, the villagers are not out of danger, for, as Marusia points out, "The officer is only one man, and the Dictator has men like him in plenty." Indeed, the next visitor to Zhitya is the Dictator himself; however he is no match for Marusia who has devised a fiendishly clever plan to outwit him. Enough is Marsha Forchuk Skrypuch's second successful picture book collaboration with award-winning illustrator Michael Martchenko. In it, the author uses a classic folktale formula wherein the small and the good defeat the big and the evil. Martchenko's spirited watercolours are wonderfully detailed. They have a whimsical humour which gives the story a light-hearted feel despite its tragic setting. Particularly appealing are the richly illustrated end-papers which represent a Ukrainian babushka. Young listeners will warm to the courageous protagonist and derive immense satisfaction from the outcome of her clever ruse to deceive the Dictator. For older readers, a sharing of Enough may open a chapter of history that has not been accessible to them. To help students learn more about the famine, the author has listed other resources, including a book, a film and an excellent website. Skrypuch's appealing combination of folklore and history should guarantee a wide range of readers at the elementary level.